We Believe in God, We Believe in Life, We Believe in Miracles. 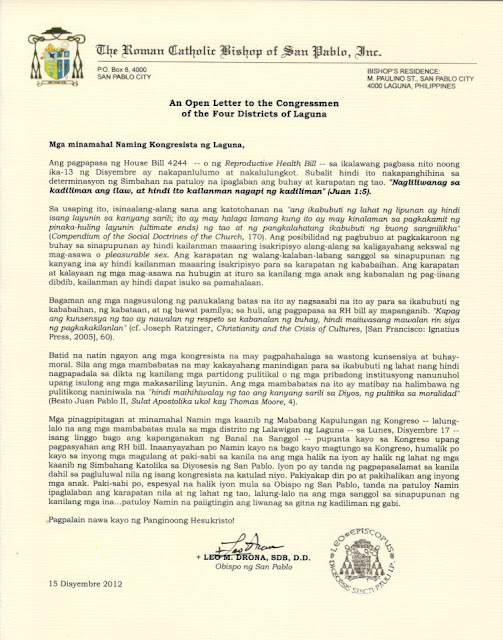 3) Pastoral Letter of Abp. 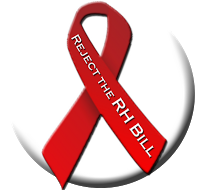 Luis Antonio Cardinal Tagle on the RH Bill (after the 2nd voting). 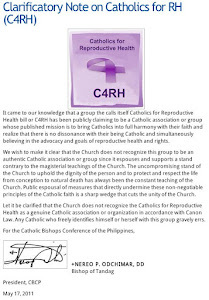 "Pahayag sa Simbanggabi, Dec. 16, 2012..."
In the interests of fairness and accuracy, this statement by Cardinal Tagle -- which mentions the RH bill only in passing -- does not directly tell Congressmen and Senators to vote versus the RH bill. Instead, it simply tells them to "accept Jesus with joy", and reminds them that it is the Word and Wisdom of Jesus that is necessary to form consciences. On the feast of Our Lady of Guadalupe, our congressmen voted on second reading the Reproductive Health Bill. The goal is to rush the passage of the Bill before the start of the Congress Christmas break. The same seems to be the goal of our senators. 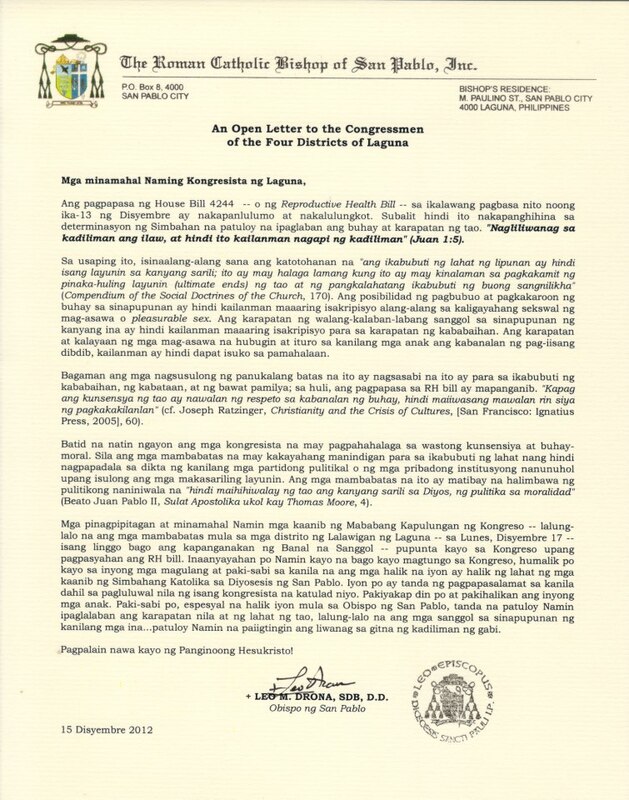 I am very pleased to issue this public commendation to our representatives in Congress namely Congresswoman Gina de Venecia, Congresswoman Rachel Arenas and Congressman Leopoldo Bataoil for voting against the Reproductive Health Bill. They are our heroic and exemplary representatives in Congress. They voted to stand up for life. They voted to stand up for morality and decency. They voted as God loving government officials. 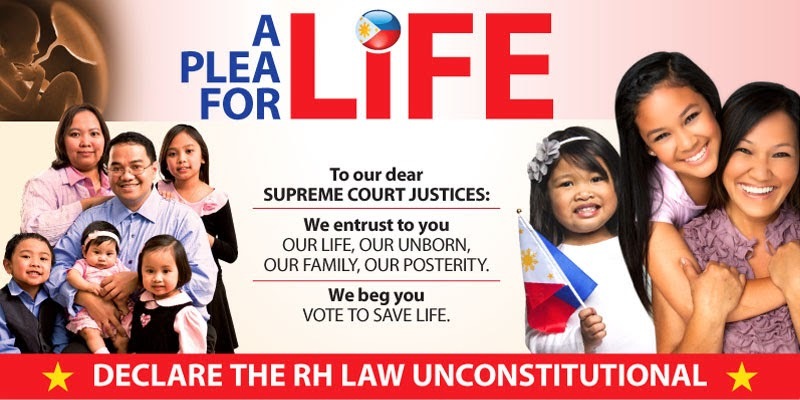 We commend them for their courageous conviction and encourage you my dear Catholic faithful to support them with your prayers and make known to them your appreciation for their fidelity to our cherished Filipino Catholic values. The Church is your mother protecting you from harm. If passed into law in its present form, it will not take long for the supporters of the Bill to see the irreparable harm they will bequeath to the younger generation. Those who mislead the young invoke divine punishment on themselves. Let us leave to the young a legacy of decency and morality not promiscuity and moral corruption.